After killing his father and trying to kill his younger brother, Hawk, older brother and black sheep of the family, Voltan, (Jack Palance) is driven mad by his quest for power and makes a pact with an evil warlock/witch creature that floats around in a cave. Fast forward years later and a battle weary Hawk is asked for help by an abbot to try and rescue an abbotess who has been kidnapped by Voltan, in order to demand a ransom from the church. Knowing that this could be a suicide mission Hawk enlists the help of a good witch, who he saved earlier, to try and find some of his old comrades in arms to help him rescue the abbotess and end Voltan’s reign of terror. These comrades include the giant, Gort, (Bernard Bresslaw), the last of the dwarves, Baldin (Peter O’Farrell) and the last of the elves, Crow (Ray Charleson). A one -handed soldier, Ranulf, (Morgan Sheppard), who’s a dab hand (!) with a specially adapted crossbow, also joins their ranks, after having previously faced the wrath of Voltan and losing his hand. With the help of the white witch they are able to fight a guerrilla war against superior forces, steal some slaver’s gold for the ransom, kill Drogo, (Voltan’s adopted son), and generally make a bloody nuisance of themselves. 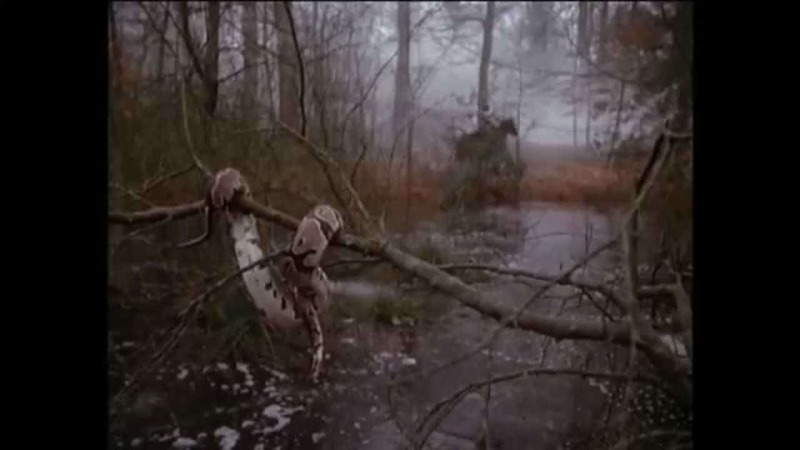 Of course Voltan doesn’t take all this lying down and sets a trap for Hawk and his band of merry misfits and soon the scene is set for one of the loopiest endings in fantasy film history. Hawk the Slayer is a bit of a guilty pleasure for me. Having seen it on video and on TV during the eighties I kind of fell in love with its medieval spaghetti western charms and it always makes me grin like an idiot whenever I see it. Don’t get me wrong, there’s a lot wrong with it, but if you can look past its inherent naffness, a smiling you will be. 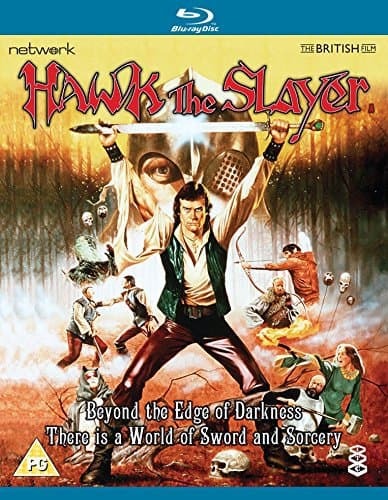 Arriving as a fantasy retort to Star Wars (well, according to writer/director Terry Marcel) Hawk the Slayer plays out like an expensive game of live action role playing, but is none the worse for it. 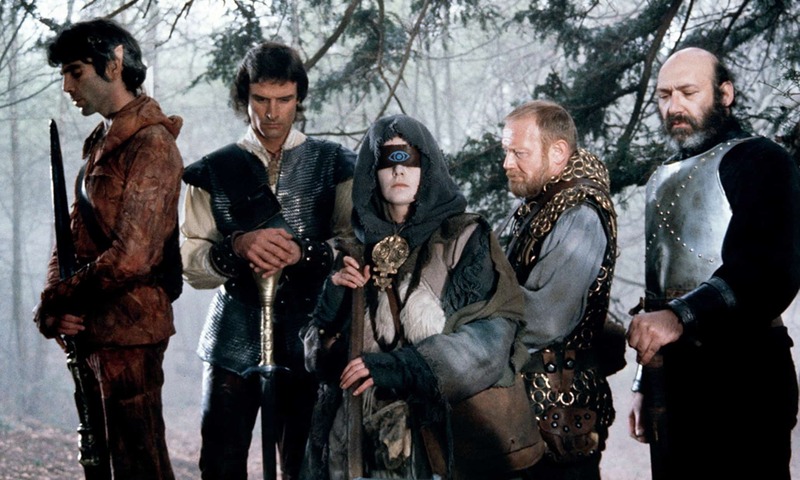 While it’s not as good as some of the other fantasy flicks that came out later on during the eighties (Dragonslayer (1981), The Sword and the Sorcerer (1982), The Beastmaster (1982), Krull (1983), Ladyhawke (1985) etc.) Hawk the Slayer seems to have matured fairly well with age, like a good slab of stilton. With a hero who’s less animated than a plank of four by four, characters that seem to have wandered in from one of Tolkien’s forgotten manuscripts, storms of glowing ping pong balls in the midst of battle, and a soundtrack that plays out like a cross between Ennio Morricone and Donna Summer Hawk the Slayer is an endearing cheese-fest of the highest order. Plus any film that includes a comedy duo of a giant and dwarf arguing about sugared nuts, forests that feature random piles of skulls and boa constrictors draped over branches, a mind-sword that floats in the air, and a ‘snow storm’ of shredded paper prominently featured during an indoors battle can’t be all that bad…can it? I guess what really makes this film for me is Jack Palance’s over-acting as the main villain – he’s obviously having a blast with the role and it makes me wonder if he was ever asked to appear in an English panto, or three, on the back of his performance here! 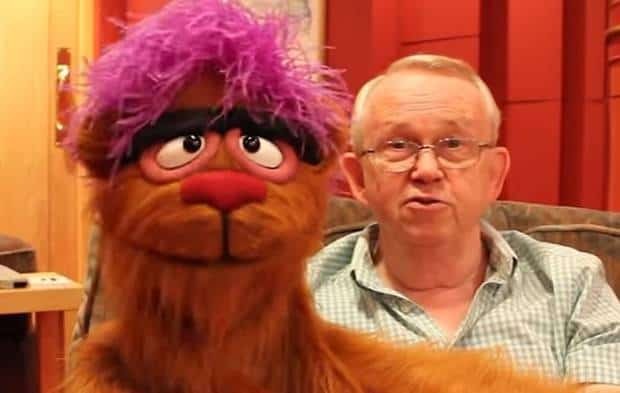 The film was slated by critics and early audiences on its initial release, but has since gained a cult of admirers and I’m proud to admit to being one. I can only hope that rumours of a belated sequel are more than just rumours and that the initially planned series about the saga of the mind-sword plays out over the years to come. Hawk the Slayer has been released on Blu-Ray and DVD and is being distributed by Network Distributing. A cool theatrical trailer; some rather pointless silent footage; an episode of the film show Clapperboard (26 mins), which focuses on the film in question, where we learn a fair bit about the production and who funded it – Lew Grade to be precise; a behind the scenes doc, ‘By the Sword Divided’ (30mins), which features various interviews with the cast and crew that were originally shot for a programme called ‘Electric Theatre Show’; another behind the scenes documentary called ‘Sharpening the blade’ (15 mins), which looks more at the stunt work side of things and sword fights, again shot for the ‘Electric Theatre Show’; and an image gallery, which features 44 stills and posters from the film. As she deals with tragic loss.